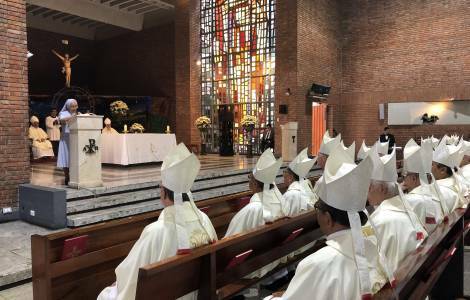 Lima (Agenzia Fides) - 49 Peruvian Bishops yesterday inaugurated their 113th Plenary Assembly with a Mass celebrated in the parish of San Antonio de Padua, district of Jesus Maria, in Lima. Mgr. Miguel Cabrejos, Archbishop of Trujillo and President of the Episcopal Conference (CEP), presided over the concelebration, together with Cardinal Juan Luis Cipriani, Archbishop of Lima, and Archbishop Nicola Girasoli, Apostolic Nuncio in Peru as principal concelebrants. According to the note sent by the Peruvian Bishops to Agenzia Fides, the President of CEP in his homily focused his reflection on synodality, a concept widely used today in the Church to describe the walking together of Bishops, priests and faithful, especially after celebrating Synods like the one on the family and the young. "The Church as God's people, is a Synodal Church, it walks together, to proclaim and witness the Gospel. The Synodal Church is a concept that is easy to express with words, but it is not so easy to put into practice", stresses Mgr. Cabrejos. "Synodality belongs to the whole Church and to all the members of the Church. The Synodal Church is nothing but walking together, to meet Christ, our Lord", he added. Mgr. Cabrejos also referred to the spirit of service: "In this Synodal Church no one is above others".